Ellen Datlow’s name to me is synonymous with horror anthology. I see the two together so often, and usually with accolades, that I decided I really did need to just read one of her collections. This one really impressed me in its variety and its quality. I typically enjoy reading horror stories like these around Halloween time, and this collection would be suited well for that kind of celebration. The hard decision will be whether to reread this one or try out another one of her collections. A review of each single story seems excessive, and there isn’t a single story that failed here. There are no common themes uniting this collection other than the very general fitting into the category of horror or dark tales. They range from very realistic to paranormal, from gruesome gore-filled feasts to nuanced, atmospheric tales, from pulp to literary. Fairly well-ranged in background and style, this is an ideal volume to discover new authors or names that you may merely recognize. Frankly, it is hard to even pick out favorites from this. For someone like me who has a wide range of tastes across the genre, each of these represents top contributions to their respective category of story type. If you are discriminating regarding the type of horror you like then this may not be the best collection. There will certainly be some or several stories here that you like, but others may hold no interest, in which case you might search elsewhere for a themed collection or just read certain selections here. 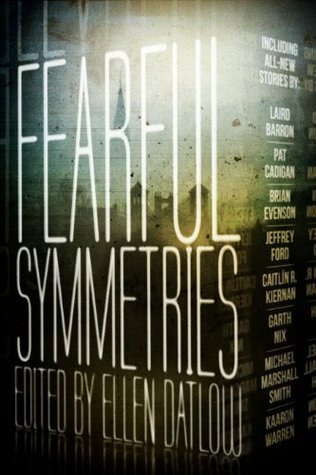 But for those wanting an intro or return to the range that the horror genre has available, “Fearful Symmetries” is absolutely perfect.